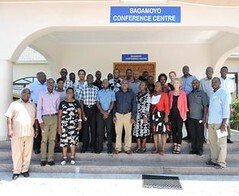 Despite being relatively new, the Dairy Development Forum (DDF) in Tanzania is already contributing to improvements in Tanzania’s dairy sector, largely by sharing information, especially through membership associations, which in turn is influencing policy changes. This finding was reported in a study of Tanzania’s Dairy Development Forum presented on 21 Nov 2014 by Kennedy Kago, a graduate fellow at the International Livestock Research Institute (ILRI), in Nairobi. Kago is completing his graduate work at Egerton University Kenya, in pursuit of a MSc degree in Agricultural Economics. The Tanzania Dairy Development Forum was created in 2013 to bring together, and better coordinate, dairy sector actors the country. Members of the forum include input suppliers, producers and processors who through it are better engaging with development partners, policymakers and researchers. 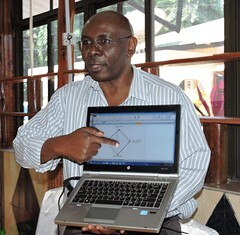 Kago’s study, titled ‘Influence of information sharing within the Tanzania Dairy Development Forum on nurturing regional platforms’, found that information sharing has improved the running of smaller regional dairy innovation platforms such as the Morogoro Dairy Platform and of working groups formed to work on areas such as dairy breed improvement. The study recommends introduction of information packages at the end of DDF meetings, for example, for those unable to attend, to help both widen and increase the impacts of information sharing. In addition, the study calls for greater and more explicit advocacy work by the forum, which it says can influence the country’s policies for more profitable, sustainable and equitable dairy development. While presenting his research findings, Kago, who worked at ILRI for six months, including 2 in the field in Tanzania, lauded the graduate fellowship program at ILRI, under the aegis of which he conducted this study. He thanked the colleagues he worked with during his stay at ILRI for their support and said that working in Tanzania had opened up training opportunities for him, enabling him to complete his MSc degree successfully. ‘I would welcome a chance to work in Tanzania again in future’, Kago concluded. Tags: DDF. Bookmark the permalink.